Essential Journeys Lotion Labels - io design & illustration, inc. It has been a pleasure working with Kimberly of Essential Journeys as her business has grown over the years. Initially, I worked with her on refining her logo and creation of marketing materials for her Soap By the Slice line. Now she has multiple products and luckily for me they all need graphics. One of my favorite items to work on has been the labels for her lotions. Bold colors + illustration focus = happy design time. 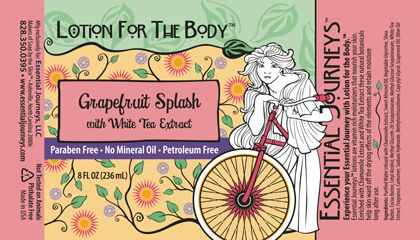 Thai Lemongrass, Purely Naked (unscented), and my favorite Grapefruit Splash. 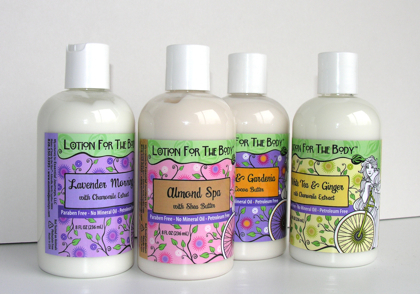 All lotions are available in 8 oz. and 16 oz. sizes, with a select few also available in a 2 oz. travel size. Check our the Essential Journeys website for ordering lotions, Soap By the Slice, Lube for the Lips and more.